Underinvesting won't make you rich in the long run. My Little Conglomerate's required rate of return when evaluating companies. Q1 2019 results and outlook. 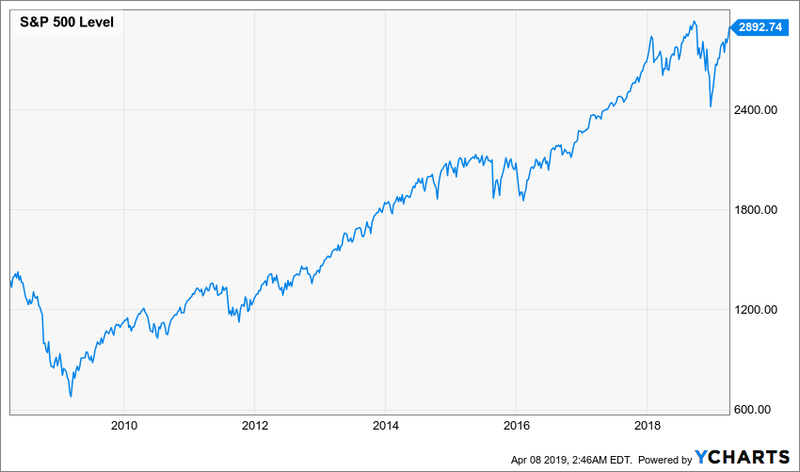 As the S&P 500 index (SPY) approaches spitting distance of all-time-high, the street has no shortage of pundits trying to call an inflection point. In fact, the whole 330% run-up from the 2008 low has probably been one of the most hated rallies in memory. Euphoria is absent despite the quadrupling of the stock market index. 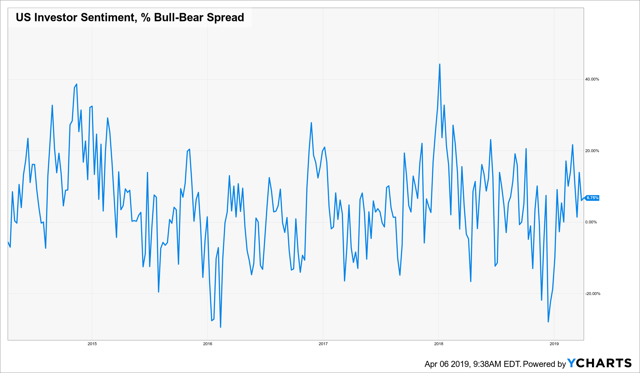 Investor bullishness remains grounded at 35% according to the AAII survey and bull-bear spread is at a limp 6.75%. Meanwhile, during the most recent correction in December, investor cash holdings rose to a historically high level. It's almost as-if the Financial Crisis last decade jaded a whole generation of investors, who all now want to make their mark by trying to call a top, and as a result stayed disastrously underinvested the whole way. This attitude caused many of them to miss the buying opportunity presented during the December correction, as the 20% drawdown was not enough for those who were waiting for apocalypse. A larger drawdown may surely come one day, but it could happen at a much higher level than here. Staying invested beats trying to be cute with market timing in almost all periods of history. Therefore, unless you are retired, you should be putting cash to work almost constantly. And you should do so with a business owner mindset, holding your investments for the long run as if you're running a business. Ask yourself this: If you owned a farm or a store, would you trade in and out of it trying to time the market? Would you exit the business every time there's a slow down? Or, would you think like a good businessman and put more cash to work by reinvesting into even more farms and stores? The goal with My Little Conglomerate (and my other personal portfolios) is to just simply acquire more and more productive assets over time, reinvesting cashflow, thereby steadily owning a bigger share of the world's economic output. There will surely be another recession or stock market correction coming some time in the future. I'll welcome it when it happens, as it would be an opportunity to further increase my ownership stake in the economy. Prices only matter in that when they are low they allow me to increase my stake cheaply. If we buy solid companies during any downturn, the cashflow and dividends will hold us over until the time another all-time-high arrives (and as history has shown, there will be always "another" all-time-high - 100% guaranteed over any 20-year period). With that out of the way, let's cover a little bit on one aspect of how we select companies to purchase. At My Little Conglomerate, we look to approach portfolio management by treating the portfolio as a single conglomerate business, where each position is a "subsidiary" with look-through earnings. This philosophy is outlined in greater details in the introductory article. Today I want to disclose a little bit about our return criteria on business selection. For each business we look at, we would calculate its expected rate of return (ROR) over the long run, and compare it against our required ROR. If the expected ROR is higher than the required ROR, then it becomes an investment candidate. If it is lower, then it is rejected. For most investments, our required ROR is simply the risk-free rate plus the historic equity premium. For US companies, we apply the 10-year treasury yield as the proxy for risk-free rate, and add an equity premium of 4.5%. We increase the equity premium to 7% for speculative companies (e.g. turnaround situations, liquidation plays, unprofitable growth companies etc). For foreign companies, we add a country-risk premium. We first look at the yield premium of the foreign country's 10-year government bond over the US 10-year treasury yield. We also look at the expected currency depreciation implied by the 1-year FX forward rate. Then we set the country-risk premium as whichever number is greater. If a negative premium is derived, we set it to zero. This required ROR is also used as the discount rate on any NPV calculations. Of course, if a company exceeds the required ROR hurdle, it merely becomes a candidate for investment as there are still other factors to consider, such as sustainability of earnings (the "moat"), leverage, ownership structure/voting rights etc. All things being equal, we would select companies with higher expected ROR. My Little Conglomerate's Owner Earnings rose significantly this quarter to $3,753 from last quarter's $2,698, partly due to deployment of the $10,000 "capital raise" that occurred at the beginning of this year. As promised in our previous updates, I plan to inject an additional 10k of capital each year into My Little Conglomerate. I expect the firm to be in "expansion phase" until I retire. I believe 10k/year is a reasonable size that can be mimicked by most of my working-age readers who want to invest their savings. The new capital this year was mainly deployed into the immediately accretive acquisition of Gilead Sciences (GILD). As a reminder, Owner Cashflow is the cash distributed to parent company by the underlying investments, usually in the form of dividends from our subsidiaries, but can also come as interests or return of capital from other investments. Owner Earnings and Owner Cashflow are expected annual figures for the current year. Shortly after our purchase of Gilead, we lowered its expected owner earnings slightly to 6.04/share based on its subsequent earnings report which is already reflected in the Q1 results table above. CAI International (CAI) is our top performing subsidiary in terms of earnings yield. Management continues to demonstrate excellent capital allocation skills, and its stock price is perhaps unfairly punished by the on-going US-China trade war noise. From a recent interview CAI's CEO Victor Garcia gave to The Wall Street Journal, the shipping industry remains strong, and any repositioning of global supply chains due to the trade war is a positive for CAI. Garcia has been buying more CAI stock for himself recently. Royal Caribbean Cruises (RCL) is another strong earner within our portfolio of businesses. We updated their owner earnings in our model to 9.86/share after their latest beat and raise quarter. They are by far the most successful cruise brand in China out of the big three cruise operators, which in turn is having a halo effect outside of China as Chinese diaspora choose Royal Caribbean for cruises in Europe and North America. Elsewhere, Royal Caribbean is executing a very interesting concept in Perfect Day, the first of 5 planned private island resorts/amusement parks exclusive to Royal Caribbean customers. Their cruise ships are expected to drop 2 million visitors onto the island each year. We are placing 2 of our holdings on watch - China Mobile (CHL) and the VanEck Vectors India Small-Cap Index ETF (SCIF). Both are on the low side in terms of earnings yield relative to our other businesses, which may give us an opportunity to increase the conglomerate's earnings by redeploying the capital. China Mobile's results were slightly worse than our expectations in terms of revenue, margins and earnings, primarily due to lower ARPU as a result of government mandated price decreases. As much as we dislike exiting businesses, we've put China Mobile on-watch for disposition, especially if fundamentals deteriorates due to further mandatory price cuts or higher than expected capital expenditure on 5G - although the formation of China Tower should lower the capex requirements of the telcos, which is a potential bright spot. We'll monitor this over the next couple reporting cycles. SCIF on the other hand, has always been a placeholder, as we prefer to hold individual businesses over funds/basket of businesses. We wanted exposure to the India domestic economy and its growing middle class, however, could not find any appropriate single names that are available for purchase for foreigners. We continue to keep an eye out for companies with good exposure to the India market (which does not necessary have to be an Indian company). We have more than doubled the firm's annual earnings since last year, and nearly doubled the cash paid to us annually. We believe a focus on maximizing a portfolio overall earnings will lead to long-term outperformance of the portfolio's market value return. And from that perspective, My Little Conglomerate achieved a 8.0% return since inception versus a 4.3% return from the S&P 500 over the same period. But we can do one better than that. While S&P is a commonly used benchmark (and most hedge funds can't even beat it), we measure ourselves to an even higher standard here at My Little Conglomerate. The S&P 500 is just a price index that does not include return from dividends. To truly compare ourselves against a passive investing style, we should compete with the S&P 500 Total Return Index, which includes the compounded return from reinvesting dividends. 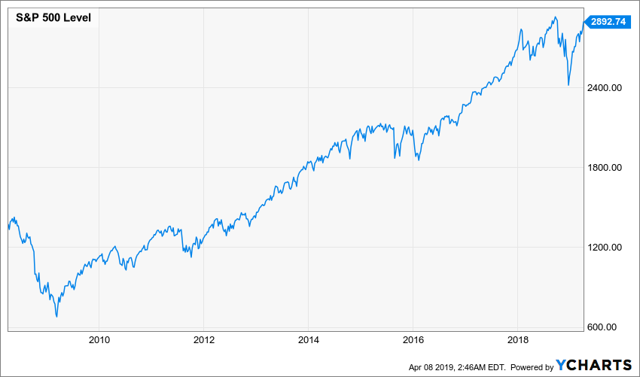 If we can't beat S&P 500's total return, then all this work is meaningless as we can just go buy an index fund and reinvest all of its dividends. We achieved a cumulative ROR of 8.0% versus SPXT's 5.9% since inception of My Little Conglomerate - so far, so good. But note: short run results are not really indicative of anything other than luck, and I'm certain that we'll go through some periods in the future where we underperform. Looking forward, however, I am confident that our investment approach will yield superior long run returns, which is measured in periods of 5-20 years. I pledge to continue to report our results against SPXT here in Seeking Alpha, and I appreciate my readers for following me on this journey. We follow a strategy of efficiently reinvesting internally generated cash as well as externally raised cash. As you can see we are now sitting at a relatively low cash level. We are not against borrowing additional cash to capture attractive investment opportunity, as long as the leverage is maintained at a prudent level and interest rates remain reasonable (similar to how a real-life conglomerate with an efficient capital structure would operate). In fact, we added to our top pick on leverage - CAI International - shortly after the end of the quarter. On April 3rd, we purchased 150 additional shares of CAI at an average price of 23.49. As always, we disclose all of My Little Conglomerate's trades slightly after the fact on our quarterly updates or on targeted research pieces, but feel free to let me know if anyone's interested in a realtime service on our trades. We are keeping our eyes open for any other new enticing opportunities. Follow me to stay up-to-date as I will usually publish an in-depth research piece for any new company that we invest in. Disclosure: I am/we are long CAI, CHL, GILD, RCL, SCIF. I wrote this article myself, and it expresses my own opinions. I am not receiving compensation for it (other than from Seeking Alpha). I have no business relationship with any company whose stock is mentioned in this article.